Pedestrians have a duty to follow certain traffic laws as well as keep a proper lookout for automobiles and motor vehicles on the roadway. Likewise, drivers of motor vehicles have the same responsibility, and no matter the circumstances, a driver should always yield to a pedestrian. This is the case even if the pedestrian is in the wrong and exposes himself to danger. In fact, drivers have a responsibility to sound the horn and otherwise attempt to alert a pedestrian who is exposed to danger or injury. Alabama Code Sections 32-5A-210 to 32-5A-222 spell out the rights and responsibilities of pedestrians. Specifically, these legal code sections primarily address pedestrian rights when crossing the street at an intersection. These laws also address when and where it is appropriate to cross a street and how a pedestrian should handle crosswalks. Pedestrian accidents can occur for many different reasons, but often, the driver of the motor vehicle is at least partially at fault for the crash. This is due to the fact that the automobile drivers have an opportunity to take evasive action and avoid injuring the pedestrian. A pedestrian who is injured can take legal action against the responsible driver, while the loved ones of a pedestrian who is killed can also file a claim for wrongful death damages. Pedestrian accident claims often involve serious injuries to the pedestrian, making it is crucial to have an experienced Alabama pedestrian accident lawyer representing you. 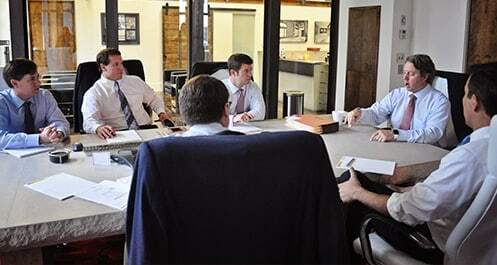 The Birmingham, Alabama pedestrian accident attorneys at Hollis, Wright, Clay & Vail, P.C. can help. Pedestrian accidents can occur anytime and anywhere and can involve both adults and children. However, the National Highway Traffic Safety Administration (NHTSA) indicates that there are certain people more likely to be victims and certain locations more likely to be accident sites. According to NHTSA, the vast majority of pedestrian fatalities occur in urban and/or metropolitan areas like downtown Birmingham. As expected, most pedestrian injuries or fatalities occur at night. As this data also shows, children and the elderly are especially vulnerable to being killed in pedestrian accidents. To further highlight the dangers and risks to which pedestrians are exposed in relation to motor vehicles, a pedestrian is killed every two hours in a traffic accident. A pedestrian is injured in a crash every eight minutes. This equates to more 4,000 pedestrian deaths per year and close to 70,000 injuries. Pedestrians who cross at non-intersections or outside of designated crosswalks. Drivers who do not yield the right-of-way to pedestrians. Drivers who disobey traffic signals. Drivers who are speeding and who lose control of their vehicle. Drivers who are distracted or inattentive. Pedestrians who don’t look both ways before they go into the street. Children need to be taught an early age to look both ways before crossing a street, and parents should always hold a child’s hand when crossing. NHTSA reports that alcohol is a significant contributing factor to pedestrian injuries and deaths. Studies indicate that when alcohol is involved, the pedestrian is the one under the influence and/or intoxicated the majority of the time. Walk on a sidewalk, and if none is available, walk on the extreme left of the roadway facing oncoming traffic. Try and always make eye contact with nearby drivers to make sure they see you. Look both ways before crossing a street and don’t simply rely upon pedestrian signals. Do not wear headphones or talk on a cell phone while crossing the street. Try and cross the street only at crosswalks but don’t assume cars will yield to you. Wear brightly colored clothing with reflective gear especially at night. Try and avoid crossing streets or intersections if you are intoxicated. Many of the attorneys at Hollis Wright are avid runners and cyclists and truly appreciate the need to protect the rights of pedestrians. If you or a loved one have been injured or killed due to careless or unreasonable driving actions, then you should contact the Birmingham pedestrian rights attorneys at Hollis Wright for a free and confidential consultation. We can help you recover for the injuries you sustained in the incident.